← I haven’t washed my hair in years……. how to eliminate almost all products, their packaging and eliminate the crap you put on your skin, hair and in your mouth. Lots of talk always going on about ‘buying green’, but if we don’t buy at all, we don’t have to worry about how recyclable our product containers are. Really, the ‘greenest of all green’ (I don’t care for that term, but it is universally accepted as an adj for what I am talking about) is making do with what you have. Our family moto is “Use it up, wear it out, make it do or do it out.” Buying stuff means you are supporting the industry of mining, shipping, usually slave labor, etc. I still buy a lot of crap, but I’ve been able to limit certain things with just one miracle product. 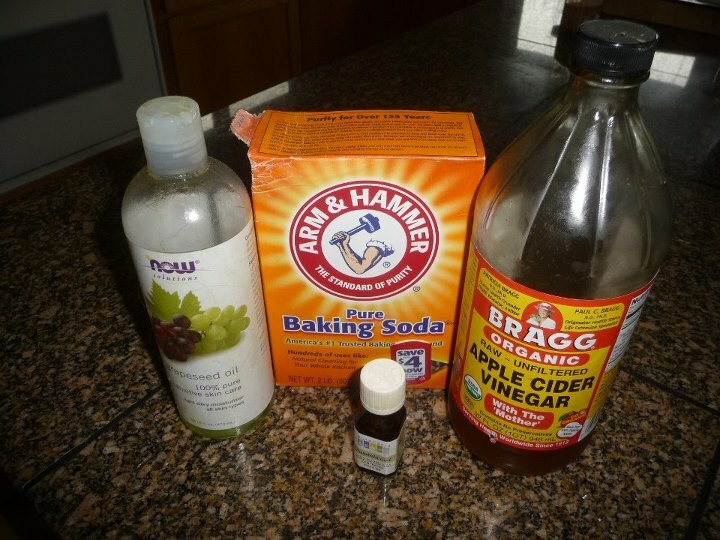 Baking soda, well, 2 miracle products, baking soda and apple cider vinegar. My favorite thing is baking soda. WE haven’t bought toothpaste, shampoo, conditioner, facial scrub, stainless steel polish, ajax or similar, in like 5 years. I think I started learning about this stuff when I was pregnant with Maya and she is almost 6. My hair is clean and my kids have NEVER had a cavity, not one single one and they’ve never used flouride toothpaste. 1. Toothpaste: I mix baking soda with the tinniest amount of peppermint oil and tea tree oil. It goes in little bowls, one for each member of the family. That is our toothpaste and it works great. No sugar, no crap, no container to throw away. A clean mouth. 2. Shampoo: We mix a little baking soda in hot water to dissolve and add a little geranium oil to the water and shake and that is shampoo. It doesn’t strip your oils or ruin your hair or make your scalp produce more oil to make up for stripping, no greasy head at all and you don’t need to shampoo your hair as often this way. 3. Conditioner: Apple cider vinegar and water and geranium oil. You can go with the oil. Sometimes I steep the ACV with lavender. About one inch of vinegar in the bottom of a quart jar, fill the rest with water and voila! Shiny, happy hair! You MUST rinse well, you don’t want your hair to smell like a fresh douche! 4. Facial scrub: a little baking soda in your hand, a drop of essential oil of choice and a bit of water and scrub your face. The perfect exfoliator. 5. A tiny bit of grapeseed oil or olive oil as your moisturizer and your good to go. 6. Deodorant: a tiny bit of baking soda on your hands, rubbed on your armpits while you are still a tad bit damp from the shower. Works like a charm. You could seriously EAT everything you just put on your body, if you do this. No waste, VERY LITTLE money and easy. Who could ask for anything more! We are trying to live The Good Life with our 3 kids out in the woods. We strive to be as self reliant as possible, with a great amount of leisure time to Live The Good Life as best as we can. We work hard so we can play hard and want to teach our kids to love life and love people and love learning. This is our journey. This entry was posted in Self Reliance, Simple Living and tagged baking soda cleaning, no poo. Bookmark the permalink. Rasing Kids for The Good Life-YIKES! Big Job.